Munson and Destler cheer McChord as the news is shared. 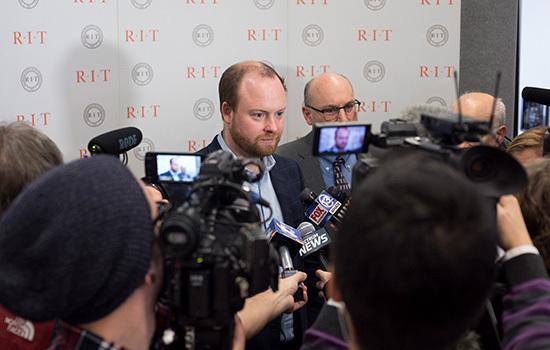 The guesses started streaming in after RIT officials said there would be historic news announced on Dec. 13. 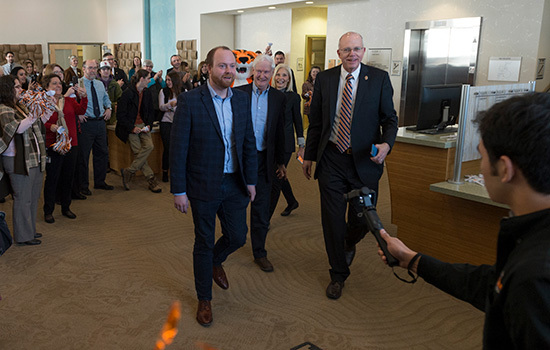 Students, faculty, staff and alumni gasped and then cheered when they heard the real announcement: A 2009 alumnus is giving RIT $50 million, the largest donation ever made to the university and one of the largest ever in the region. 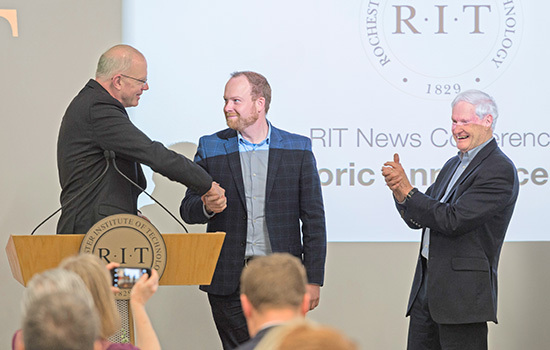 The unprecedented gift comes from Austin McChord, founder and CEO of Datto, a Connecticut-based data protection company with engineering and support offices in downtown Rochester. $30 million to foster creativity and entrepreneurship, including $17.5 million to launch the Maker Library & Innovative Learning Complex of the Future. This will be a new facility connecting RIT’s Wallace Center and the Student Alumni Union. Additional funding will go toward purchasing equipment and endowing faculty positions and student scholarships, including new “Entrepreneurial Gap Year” fellowships to help students advance their concepts into businesses. $20 million to advance RIT’s cybersecurity and artificial intelligence capabilities. This funding will be used to expand facilities, as well as to establish endowments to attract and retain exceptional faculty and graduate students, primarily in the B. Thomas Golisano College of Computing and Information Sciences, the largest of RIT’s nine colleges. And second, he wants to make more resources, such as the Maker Library, available to students so they can build and innovate for the future. McChord said he was inspired to make the donation by former RIT President Bill Destler, with whom he has developed a friendship. Lindsay Reardon, an MBA student in RIT’s Saunders College of Business, is digital marketing manager for the student-created company OWA Haircare. 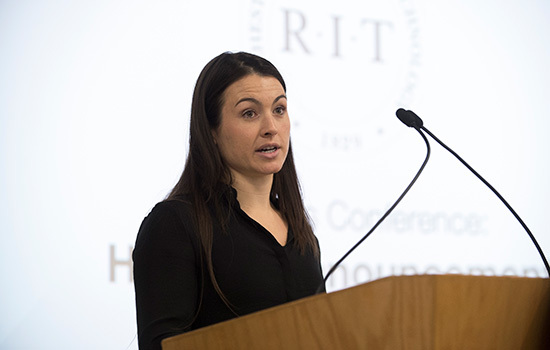 Reardon said that she is inspired by McChord’s gift and that his generosity will present RIT students with even more opportunities than she had when she started developing her business ventures. McChord has been an active alumnus of RIT, serving as a frequent keynote speaker at events, including Venture Creations graduation, the annual Entrepreneurship Conference and the 2017 Commencement. McChord founded Datto, a global provider of Total Data Protection Solutions, in 2007. Starting with an idea he had while a student at RIT, McChord started the company in the basement of his father’s office building. Datto has expanded dramatically over the past 10 years, appearing on the coveted Inc. 500 list of fastest growing private companies in 2012, 2013 and 2014. 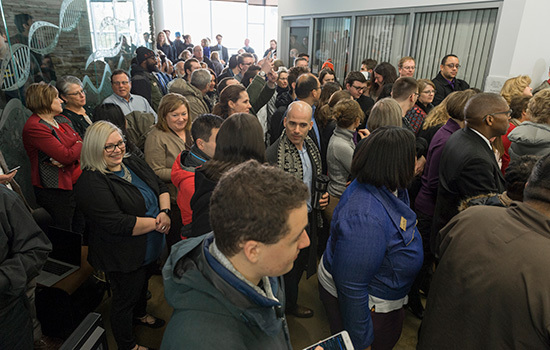 In August 2014, Datto opened a branch in downtown Rochester, becoming the first company in the region .to join that state’s START-UP NY program. Datto has grown to more than 200 employees in Rochester, and McChord said he expects the company’s Rochester operations to continue to grow. Datto was recently acquired by Vista Equity Partners and merged with Autotask Corp. McChord is CEO of the new company, which has about 1,400 employees with offices in nine countries. McChord said the acquisition put him in a position to make such a gift to his alma mater. Gleason is chairman of Gleason Corp., a Rochester-based manufacturer of machinery and equipment for the production, finishing and testing of gears. He is also chairman of the Gleason Family Foundation, an independent grantmaker. Golisano is the founder of Paychex Inc., a Rochester-based provider of payroll, human resource and benefits outsourcing solutions. In 1985, he founded the B. Thomas Golisano Foundation, one of the largest private foundations in the United States devoted exclusively to supporting people with intellectual and developmental disabilities. Kodak’s history of supporting and partnering with RIT dates back to 1887, when company founder George Eastman made his first donation—a $50 gift—to the university’s forerunner, Mechanics Institute. In 1901, Eastman donated $625,000 (approximately $17 million today) to Mechanics Institute. Established as the Japan Shipbuilding Industry Foundation in 1962 to focus on philanthropy related to the shipping and maritime fields, the Nippon Foundation today supports programming in education, social welfare, public health and other fields. In 1993 and 1994, the foundation donated $2 million to establish the Ryoichi Sasakawa Scholarship at RIT’s National Technical Institute for the Deaf. Saunders, a prolific entrepreneur, is currently president and CEO of Saunders Management Co., having previously launched several companies, including Truckstops of America chain (now TravelCenters of America), which grew into the largest full-service truck stop and travel center network in the United States.